The NSA is requesting broad latitude in applying domestic surveillance to United States citizens without their knowledge. This is being done under the guise of “preventing terrorism” and is being championed by a United States senator named Sam Albert. Murder and political intrigue ensue peppered by opposing arguments concerning the dangers and merits of warrantless investigation of American citizens. Gene Hackman’s character, a former NSA employee, reveals that the telecommunications industry is “in bed with the government” and that there are large-scale datacenters scouring and storing private phone conversations and e-mails for keywords like “bomb” or “Allah”. All of this is being masterminded by Jon Voight’s character who, we told in the film, was born on September 11th. The supporters of domestic surveillance in the film cite the countless lives that have been spared by removing the red tape associated with domestic surveillance, while those opposed decry the removal of our civil rights in the name of safety. Just for a splash of extra authenticity the Congressman is cheating on his wife, the government is spending a lot of money with minimal oversight and an El Camino catches fire following a minor impact. While it is much easier to find modern parallels with the benefit of hindsight, what was dismissed as creative fiction by most has turned out to be rather prophetic. 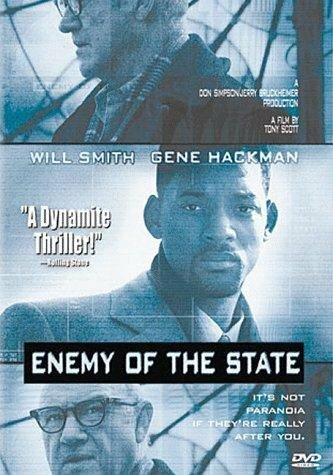 We now know that exactly 10 years after this movie was produced the NSA began its PRISM surveillance program. This program, with the cooperation of large telecommunications providers, enables the NSA to gather citizen data under the banner of public safety. Even the real life legislation (2007’s Protect America Act) that gave birth to the PRISM program sounds like the one in the film. We know all of this because one day after it was revealed that telecommunications giant Verizon Communications was turning over customer data to the NSA, contractor Edward Snowden went public with PRISM’s existence. It turns out the most unrealistic aspect of the film was how efficiently the government could utilize the data in a meaningful way. It never ceases to amaze when a spy movie shows a bunch of MIT graduates surrounded by monitors while an emboldened supervisor barks things like “get me all the June security footage from the Starbucks on Poplar!” or “find out where that tunnel leads!” and it actually happens. I can tell you from experience that Starbucks does not keep security footage that long and even if they did it would take you two hours to find the proprietary codec to view it. As far as the tunnel goes, in all likelihood the only plans of the tunnel are hardcopies rotting away in an unfinished municipal basement. My favorite is when someone brings up a digital image comprised of a finite number of pixels and by yelling “ENHANCE!” suddenly we are presenting with a picture so clear we can remotely compare dental records. There is a chance that I have dramatically underestimated our government’s ability to quickly integrate disparate data systems in a meaningful way, but if that is the case then someone owes this country’s veterans an apology. Since 2008, the Department of Defense and the Veterans Affairs Department have spent over $1 Billion dollars trying to create a single records system that would contain all vital health records for soldiers and streamline the process of claims. Earlier this year, it was announced that they couldn’t create a separate system after all and would simply have to try integrating the two existing systems. If it takes us 5 years and one billion dollars to clarify what we can’t do, I would hate to see the budget and timeline for projects we can do.